In a fishbone, an idea map, or a CT tree, you can quickly generate a brainstorm list by typing items in the task pane, or by importing variables from other tools in your project. In a brainstorm diagram, choose View > Task Pane. In the task pane, type an item and press Enter. The following image shows an example of a brainstorm list. 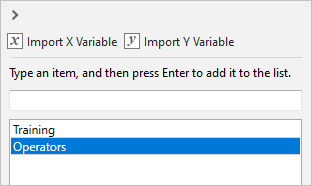 To import variables from other tools into the brainstorm list, click Import X Variable or Import Y Variable in the task pane, and then, in the Data Selection dialog box, select the variables to import. Select one or more items in the list and drag them to a shape on the diagram. You can also drag items back to the list. For more information about how to arrange the diagram, go to Arrange the brainstorm diagram.